Tempco is entering the Industry 4.0 with the iTempco IoT Platform for real time monitoring of industrial thermoregulation plants. Connectivity, big data and analytics are opening new horizons of possibilities in the thermal energy management, enhancing the levels of asset optimization and energy efficiency achievable thanks to the real time condition monitoring of equipments and data process analytics. 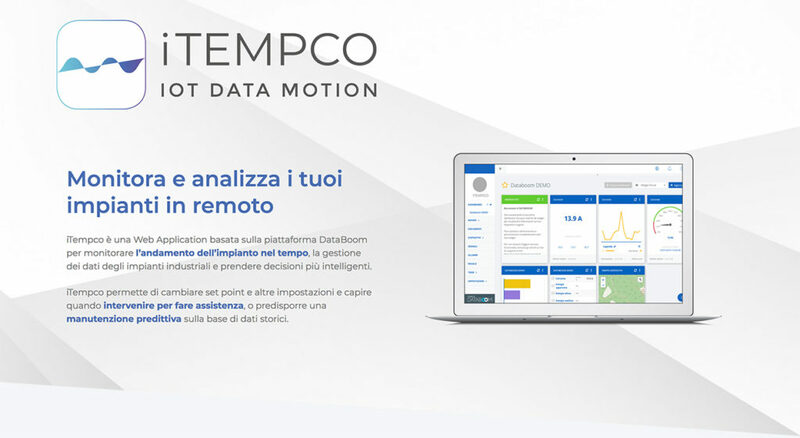 The iTempco IoT platform offers a variety of tools for the remote monitoring of equipments, with advanced functionalities of predictive maintenance, service and management of thermal machines, equipments and plants. The user receives a hardware interface device pre-installed on the Tempco machinery, that enables the connectivity on the plant. The device provides the harvesting of data aimed to feed the iTempco dashboard for condition monitoring and fault detection, also allowing to adjust and modify remotely the configuration parameters of thermoregulating units and thermal machines. The IoT applied to thermal energy management machines allows to maximize the production efficiency with costs optimization, increasing as well the equipments’ availability thanks to real time fault detection and data-driven predictive maintenance based on the actual operating status of the plants. Let’s call it Smart Thermoregulation… are you ready to enter with us the world of Thermoregulation 4.0 with iTempco?